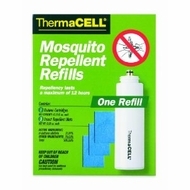 ThermaCELL Mosquito Repellent works to protect you from bugs by using the repellent, allethrin. Allethrin is a synthetic analog (chemical copy) of a naturally occurring insecticide, pyrethrin, found in the pyrethrum flower of the Chrysanthemum family. Refills can be stored for long periods of time and do not have to be used all at once. When done using, turn the unit off and restart when ready. It should be stored in a dry, dark place if time between uses is more than a week. Mat must be replaced when it changes from blue to white. Provides a shield from mosquitoes and other pesky insects. All ThermaCELL models use the same refills. Each cartridge lasts up to 12 hours, and each mat lasts up to 4 hours.